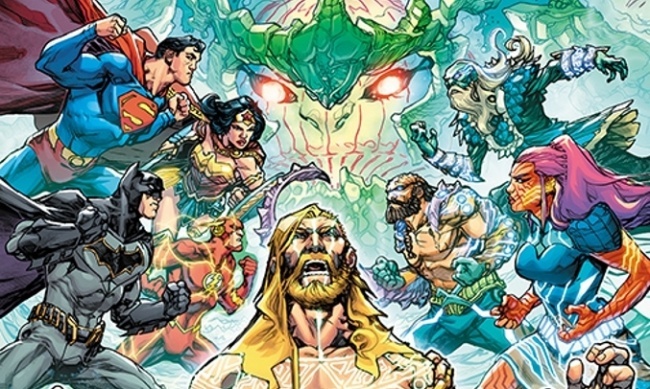 DC Comics is unleashing a tide of terror on Aquaman and the Justice League this November with the Justice League/ Aquaman: Drowned Earth crossover event. 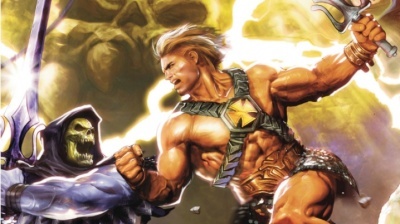 Penned by Jamese Tynion IV, who is scripting the Justice League Dark/Wonder Woman event in October (see “It's 'The Witching Hour' for Wonder Woman and Justice League Dark”), the series will also enlist Justice League writer Scott Snyder and artists Howard Porter, Francis Manapul, and Frazer Irving; and Aquaman team Dan Abnett and Lan Medina. 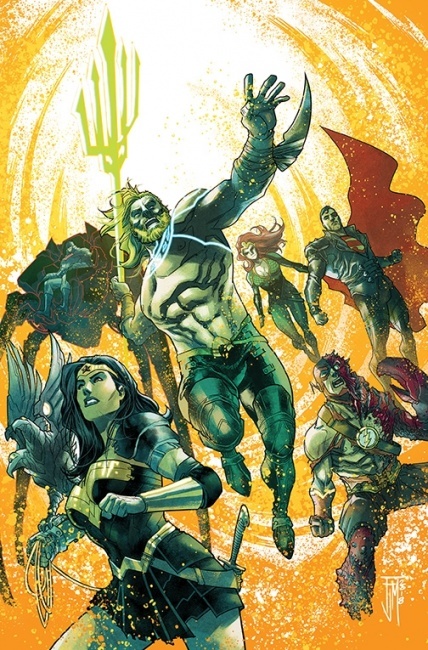 The saga will begin in a 48-page one-shot written by Tynion IV and drawn by Porter, Justice League/Aquaman: Drowned Earth, which releases on October 31. The long-forgotten underwater deities, the Ocean Lords, arise from the depths, and they have an ancient grudge to settle with Aquaman and Wonder Woman. Aquaman however, must face off against Black Manta while the rest of the Justice League attempts to stop the Ocean Lords from flooding the planet. The battle continues in Justice League #11 by Snyder and drawn by Manapul on November 7. The Ocean Lords have unleashed an alien army, and are threatening to transform the Justice League into fish monsters! Batman is holed up in the sunken Hall of Justice guarding the Totality, but the Hall may not be the impregnable fortress he thinks it is. In Justice League #12, releasing November 21, Tynion and illustrator Frazer Irving unveil the next chapter of this insane adventure, which sees a bed-ridden Batman, stuck in a full body cast, attempting to fend off the Legion of Doom. Aquaman battles Poseidon and Mera uncovers information that could change the tide for the whole planet. Also releasing on November 21, Aquaman #42 by Abnett and Medina will include a story where Aquaman and Wonder Woman discover the secret to defeating the Ocean Lords. But is it really the right thing to do? The event reaches its conclusion in Aquaman/Justice League: Drowned Earth #1, on November 28. This 48-page one-shot will see Aquaman fighting to stop the rising tides, because it all comes down to his ability to restore balance to the land and seas. See all five covers in the Gallery below.